Brown-banded roaches have been reported to spread at least 33 kinds of bacteria, six kinds of parasitic worms and at least seven other kinds of human pathogens. Measuring about 10 to 14mm long, brown-banded cockroaches have been reported to spread at least 33 kinds of bacteria, six kinds of parasitic worms and at least seven other kinds of human pathogens. If you've had a close encounter with pests and need some answers, just ask Abell. We’re on it. Measuring about 10 to 14mm long, the brown-banded cockroach is a small species of cockroach that got its name from the two lighter bands they have across their dark brownish bodies. Male brown-banded cockroaches have full wings that reach beyond the tip of their abdomens, while female roaches have underdeveloped wings that prohibit them from flying. Brown-banded cockroaches tend to prefer warm and dry locations. It's also common to find them hiding in higher locations and away from water sources. They can be found on the upper walls of cabinets, inside pantries, closets, dressers and other furniture. They can also be found hiding behind picture frames and inside clocks, radios, light switch plates and door frames. The brown-banded cockroach has three developmental stages: egg, nymph and adult. During her adult life a female produces about 14 egg capsules, each containing an average of 13 eggs. The length of the egg stage varies from 37 to 103 days, depending on temperature. Eggs are laid in capsules, which the female carries for about 30 hours before she fastens it in clusters inside furniture, undersides of tables, draperies, wall decorations, shelving and ceilings. The nymphal stage ranges from eight to 31 weeks. A female adult has a life span of 13 to 45 weeks; each female produces about 600 descendants per year. Are Brown-Banded Cockroaches hazardous to humans? Cockroaches can spread diseases, contaminate food, cause allergies and cause asthma reactions. Brown-branded roaches have been reported to spread at least 33 kinds of bacteria, six kinds of parasitic worms and at least seven other kinds of human pathogens. They pick up germs on their legs and bodies as they crawl through decaying matter or sewage and then transfer these germs to food or onto food surfaces. What causes a Brown-Banded Cockroach infestation? Cockroaches are attracted to food, water and shelter. They will eat anything and are particularly attracted to starchy foods. How can I prevent a Brown-Banded Cockroach infestation? Cockroaches most likely enter properties by boxes, groceries or used furniture. Careful inspection of produce or packages entering the home or building can help to prevent cockroaches from establishing themselves in your property. How do I remove a Brown-Banded Cockroach infestation? To prevent brown-banded cockroaches from infesting your property, practice good sanitation. Vacuum often, keep a spotless kitchen, and seal all gaps around pipes and crawl spaces. 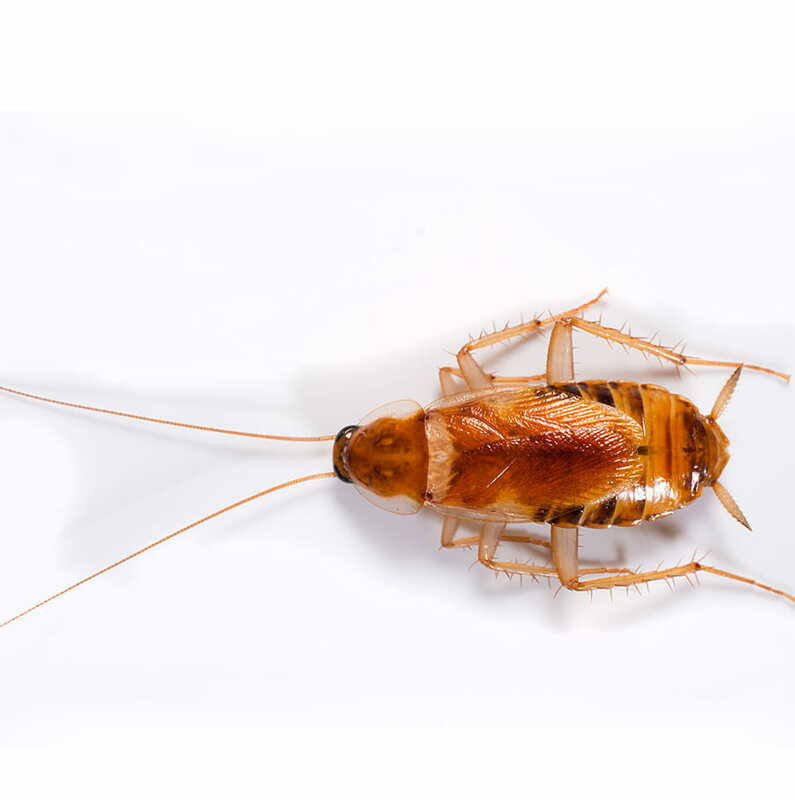 If there is evidence of a cockroach infestation, contact your Technician at Abell Pest Control to treat your infestation.